1 Combine strawberries and water in a large pot; crush lightly (use a potato masher) to start releasing juices. Bring to a boil over high heat, crushing and stirring often. 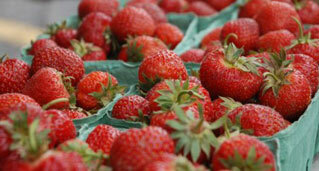 Reduce heat and boil gently, crushing and stirring often, for 5 to 10 minutes or until strawberries are very soft and juicy. Stir in basil and boil for 1 minute. Remove from heat and let steep for 20 minutes to infuse basil flavour. 2 Rinse a jelly bag and wring out until just damp. Suspend bag on a frame over large measuring cup or bowl and fill with strawberry mixture (or tie filled bag with kitchen string and hang from a cupboard handle). Let drip, without squeezing bag, for about 2 hours or until juice measures 4 cups (1 L). 3 Meanwhile, prepare boiling water canner, 6 canning jars each 1 cup (250 mL), and 2-piece canning lids according to manufacturer’s directions. 4 Boil balsamic vinegar in a small saucepan over medium-high heat for about 5 minutes until reduced to ¼ cup. Let cool. 5 Combine measured juice and reduced vinegar in a clean large pot; stir in pectin. Bring to a boil over high heat, stirring often. Gradually stir in sugar. Return to a full rolling boil, stirring often. Boil vigorously, stirring constantly, for 1 minute. Let stand, stirring often and skimming off foam, for 5 minutes. 6 Pour jelly into hot jars leaving ¼-inch (5 mm) headspace (any extra can be poured into a ramekin for immediate use once cool). Wipe rims, place lids on jars and screw on bands just until fingertip-tight. 7 Boil filled jars in boiling water canner for 10 minutes. Turn off heat, uncover canner and let jars stand in water for 5 minutes. Transfer jars to rack for at least 24 hours to set. Remove rings and wipe jars. Store in a cool, dark place for up to 1 year. Refrigerate jelly once it’s opened.